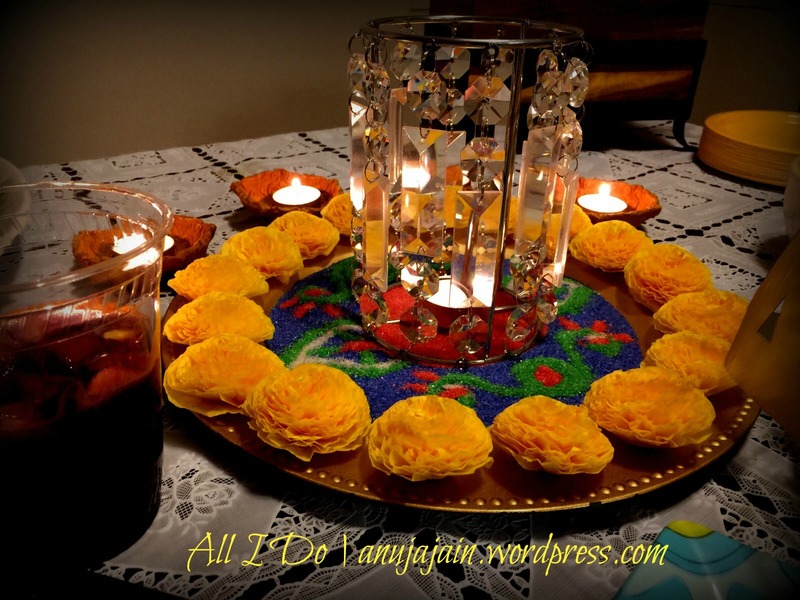 Last year, when we initially thought about organizing a Diwali party, first thing that came to my mind was decor. 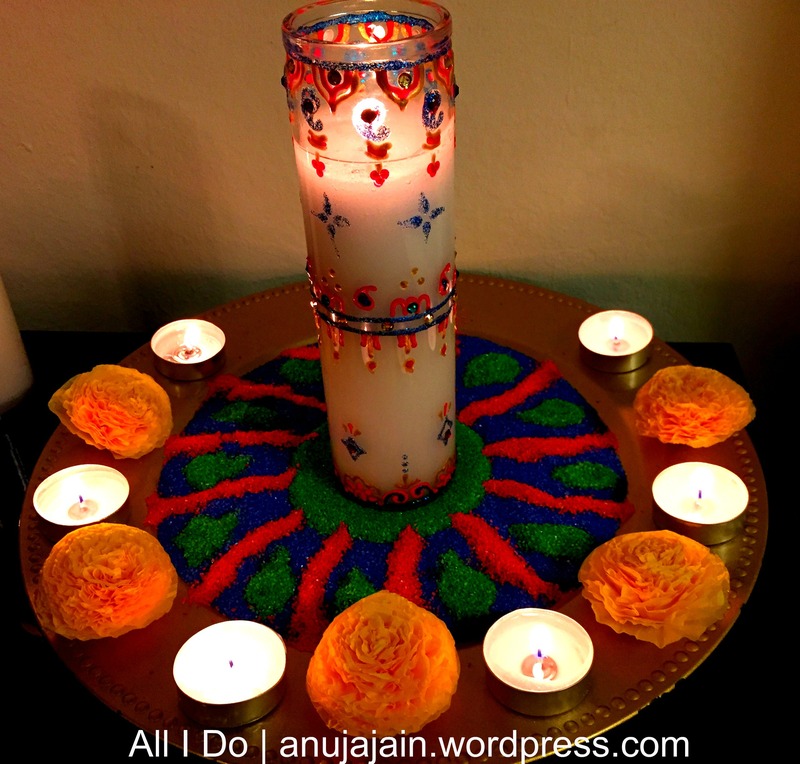 I wanted my home to scream Diwali with multitude of decor elements in each and every corner. 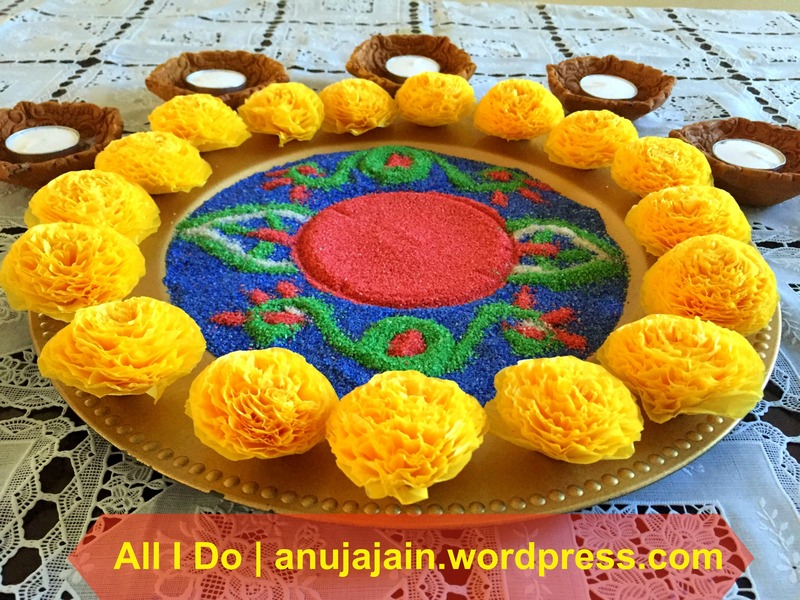 Marigold flowers fresh or fake, were among top of the list. Of course I wanted to go handmade as much as possible. Also, I do not like to hurt plants by taking flowers. A rose from hubby darling once in a while is good, but dozens of flowers to decorate the house and tossing them all in garbage compost pile in two days makes no sense to me. 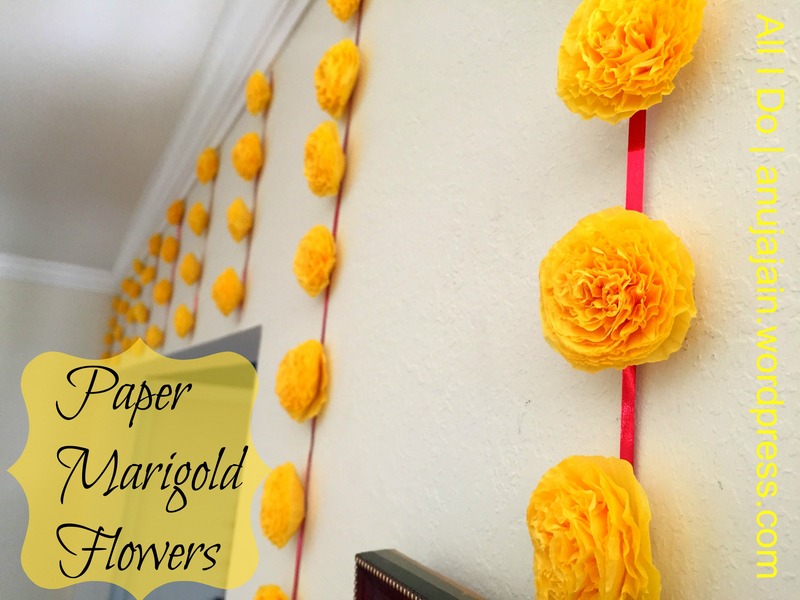 Paper marigold was the way to go! Next step was to finalize the technique/ style of paper flower making out of the ones I have tried before. I wanted them to look as close to real as possible, I wanted them in huge quantities and I wanted to make them quickly! Out of all the techniques I know, there was only one that fits the bill. You will need stack (10-12 layers) of tis sue paper cut in 2 by 2 inch size (I stack whole sheets of tissue paper and then fold , cut , repeat until I reach my desired size. Put a staple at the approx center of your tissue stack squares and pile them up. Once you have enough, take your scissor and trim the corners to give your squares a roughly circular shape. Pick a stapled circular stack and gently raise the top most layer from all around and crumble in the center. Repeat for all the layers. Be very gentle to avoid ripping the paper. 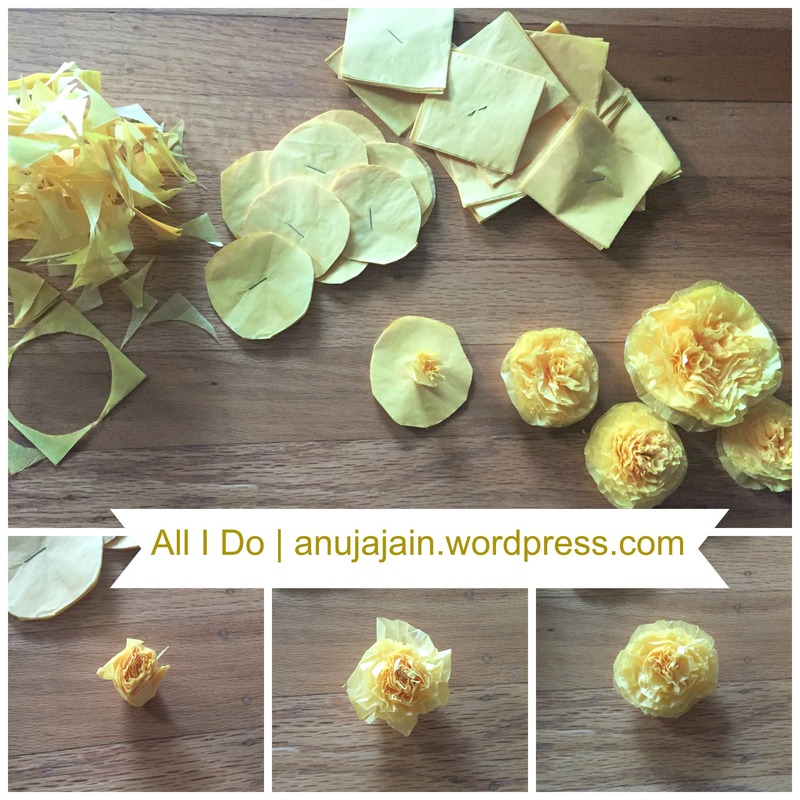 Once you have your little bundle of mess ready.. turning it into a flower is a rewarding task. Gently pull the crumbled layers outwards one after another. Don’t apply pressure on the top. Repeat until all the layers are well spread. Don’t fret about making the perfect circle.. you will be surprised how badly shaped stacks turn into beautiful flowers. If you are making bigger size flowers, increase the number of tissue layers. I made a huge amount of stapled circular stacks beforehand and did the flower making whenever I had some free time. Keep the stacks in your purse to crumble when you are waiting for your dr.’s appointment, chatting with your friends or just sitting next to the hubby darling while he drives. Avoid puffing the flower when you are out and about. They might get crushed in your bag. The flowers in crumbled state are okay to toss in your bag.